At Easy Peasy Kids I get a lot of enquiries on how to implement certain rules or boundaries in controlling child behaviour. In my experience I find simple visual aids a fantastic tool to use with children who are two years and older. Children need to understand clearly what behaviour is expected from them at a level they can comprehend and visual aids are a great way to do this. A child’s behaviour improves when they understand what is expected of them and simple visual aids are a fantastic way of doing this. I use the Never Ever poster, and all you need is a big piece of paper or card and a pen. Think about the things your child does that are inappropriate or somethings you do not want your child to do, then sit with them and together talk about what we should never ever do. Go over the Never Ever poster with them and explain each item e.g.You Never Ever push other children, because it hurts the other child and makes them sad. It is not nice to feel sad. By giving a reason to your child, they are able to realise the consequence of their action. This also enables them to develop self control and an understanding of emotions. The poster can include some funny Never Ever items like do not pick your nose as children love talking and laughing about bogeys and the like. Keep the poster simple and do not add too many points. What a great giveaway…and the Never Ever chart is a perfect fit for our family. We’re just starting a new Listening star chart, so it is a great time to introduce it alongside. What a fab post! I’ve found visual aids work brilliantly with my son. I’ve actually just made him a socialstory book about ‘giving up his bottle’. That way he’s prepared well in advance& it doesn’t come as a big shock. ‘Thats mean’would be very useful at our place. will be making a poster with miss 5 today and ill Add never ever put smarties up our noses lol 🙂 I need Thats Disgusting!! What a great idea. I love concepts which involve the kids taking ownership of their own rules. We could do with “That’s mean” at our place. Fantastic idea! And just in time for school holidays here in Qld. My boys would definitely benefit from all 3 books but I’d choose That’s Digusting as my first option! Thanks. Love the board, especially if children get a hand in creating, drawing or adding their input – owning the idea is a real step in getting kids to do what it says. With 3 boys at home I could take any of those titles, but I especially like “That’s Disgusting” my youngest, age 3, does the most disgusting things – we’re in the fart and ‘poo’ talk phase. I think he would benefit from the ‘Thats Mean” book he is quite a boystrous little man so dosent quite understand that something just arent nice at all. I was just today thinking about making a house rules chart and wondering how to do it. The Never Ever idea looks fantastic!!! We are working on emotional regulation with our three (one in particular) and appropriate ways to express anger and frustration being at the top of the list! That’s Mean would have to be my choice for today! Would absolutely love this to go along with the work we are doing! Natalie, I love this and had never heard of it before. Thank you for sharing it. Can I use it in my sessions? 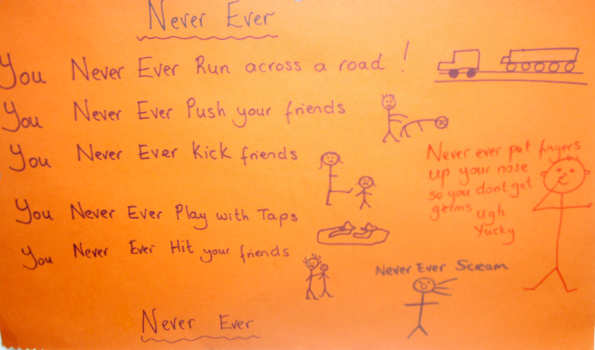 I love the never ever poster – is it too early to start for an almost 3 year old – I’m not too good at drawing! I use the Never Ever poster from about 18months. I can’t draw either as you can see from the poster, stickmen or anything you can draw is great. I have two boys so I DEFINITELY need the ‘Thats Disgusting’ one. I just mentioned on the Planning Queens post that I remember shouting out, “Get that pencil away from the cat’s bum!” then sitting back and realising that I had NEVER EVER said those words in a sentence before. Not exactly boardroom material!! Penny I’m laughing so much at your comment, it is amazing what we say when we are mums and great we laugh about it too. 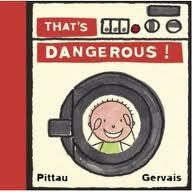 I love this…I would like to have the That’s Dangerous book…where I can buy them if I don’t win? Awesome stuff here lady…thanks heaps! Love this website and the idea behind the books. I’m a mum of 2 and a Family Day Care Educator. 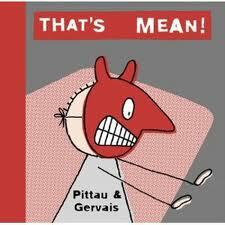 “That’s Mean!” would be a fabulous book to add to the collection. Kristie when I firts arrived in Australia I was a FDC for 18 months. Used the books and Never Ever board with the kids, they loved it . That’s disgusting – love the humorous tone! Would definitely hit the right note. With a 9yo girl and 2 boys 3&4 any of them would be fantastic!!! But the most common words to come out of my mouth at the moment are “That’s disgusting” closely followed by “That’s mean” so either book would be great!! thats mean. master 4 is a little ninja and can’t quite understand the difference between wrestling with dad and walking past mum and kicking her (inserst laugh when mum says ow) or last night in anger pushed little sister … Theres only so much you can blame on ‘dad’! Great idea. Fav book: that’s dangerous, followed by that’s disgusting. My little 2 year old book worm might just learn if he read Thats Mean! Fantastic idea, but I feel like I have too many never Evers to put on a board!! My question though is once it is on the board and explained to the child (my son is 3 next month…) and they do something that is on the board, what is the best action to take to stop them re-offending? I love the idea of your Never Ever Chart – I was at a loss where to start with my 2 year old… but I think this visual aid will be great. Just wondering what age range would this work for? I have an 8 year old that is really pushing every limit I place. But the issues are about playing in the mornings instead of getting ready for school, watching TV while I am getting ready etc etc. Do you think this would work or is there something I could use for older kids? With older children I use a whiteboard instead of the Never ever board and sit and talk with them about morning routines, why its important to get ready and the effects it has when they don’t get ready. For example being rushed is no good for anyone one. It’s always good to start the morning well as it makes mum happy and a happy mum mean you’ll be happy. Explain that if he cannot get dressed with TV on, it will be turned off until he is dressed. Communicate how it makes you feel when he doesn’t listen it makes you feel cross and sad and you don’t want to feel that way beacuse you love him so much. If you need further tips just drop me an email through the contact tab on the website. Love the Never Ever chart idea! We had a morning routine chart for a while, but it just didnt work for us…might need to revisit it again! that is an awesome idea for that poster- I’m a high school teacher and yes children of 17 years still need rules and routine! Anzac Day "Thank you for our Freedom"
Boys and Dolls "My son plays with dolls. Will it make him Soft or Gay?"